In a potent demonstration for safer streets, 1,000 Londoners staged a “die-in” with their bikes in front of the city’s transportation offices Friday. ABC producer Meredith Frost shared the above image, taken during the 15 minute demonstration. It has been going viral on the Internet. 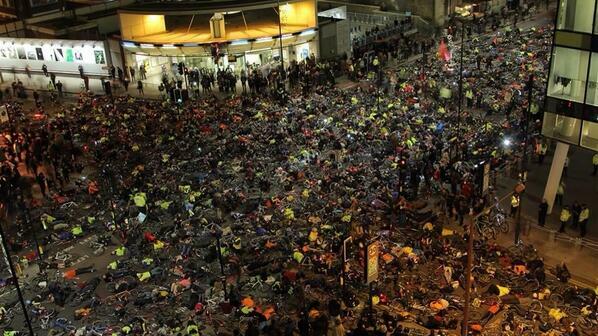 The original photo was taken by a member of the public and given to the Stop Killing Cyclists protest group. Demands for safer streets have gained urgency in London following the death of six cyclists in a two-week period. Organizers are demanding 10 percent of the city’s transportation funds for safe bike infrastructure. The die-in tactic has some detractors, who think it will scare people from cycling and obscure evidence that cycling has recently become safer in London. But the BBC points out that similarly blunt and aggressive protests were key to the success of the 1970s-era safe streets movement in the Netherlands. They have also been used, with some success, to demand better infrastructure in American cities such as San Diego. Back in 2009 I attended a die-in in L.A. (it was part of that month’s Critical Mass) following a deadly crash on Glendale Boulevard. It’s a pretty dramatic moment when everyone just drops down on the ground while a couple of photogs (myself included) are wandering around grabbing pictures. I can only imagine the power of tripling the number of bikes that we had back in 2009. We are Christian Loan Organization formed to help people in needs of helps,such as financial help.So if you are going through financial difficulty or you are in any financial mess,and you need funds to start up your own business,or you need loan to settle your debt or pay off your bills,start a nice business, or you are finding it hard to obtain capital loan from local banks, for the bible says””Luke 11:10 Everyone who asks receives; he who seeks finds; and to him who knocks, the door will be opened”so do not let these opportunity pass you by because Jesus is the same yesterday, today and forever more.Please these is for serious minded and God fearing People.